I understand and agree with both sentiments. The sad fact of the matter is that Ondra doesn’t sit at a desk all day, either. Nor is he 40. Nor is he comfortably in the middle of the bell curve, which is where most of the people who need strength tend to sit. I would love it if climbing were the only activity needed for total athletic development. However, the high level of sport-related overuse injuries coupled with the massively imbalanced musculatures we see in the sport tell a different story. 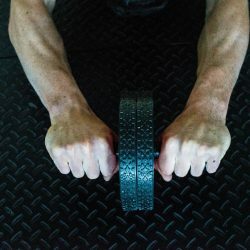 I think many climbers’ opposition to strength training is based in fear: fear of “getting big,” of looking silly in the gym, of self-confrontation. I have always held that strength should take up as little time as possible, and that climbing should always be your primary focus. With this in mind, I suggest that you assess the weak links in your athleticism and address them through targeted training…with the goal of climbing more and training less. I do not presume that the programs I design are the best strength programs, just that they are programs that have worked to make climbers stronger…with actual performance improvements down the line. I don’t care how far you can push your squat or deadlift numbers, I care how hard you send. Our programs are fairly simple and feature a focus on quality movement. 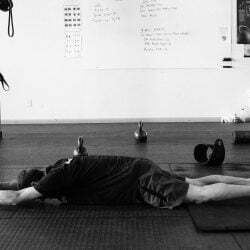 I believe it is better for the athlete to find the training too easy than to feel they fall short each and every session due to time, or intensity, or complexity of movement. Movement Preparation and Warm-Up: This is the most boring and under-valued part of the session. Warming up prevents all kinds of injuries, but it also creates a situation in the body where maximum efforts are possible. If you don’t have time for the warm-up you don’t have time to train. 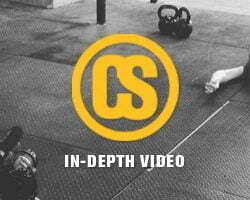 We look for 6-8 minutes of multiplanar bodyweight movements, including lunges, rotations, presses, and easy pulls. More than anything, you want to feel loose and warm by the end. This is also a good time to address specific issues such as tight lats or immobile hips. Strength Sets. We program strength from four basic movement patterns. Although we usually train all four patterns in a session (upper body press and pull, hip hinge, and squat), more advanced athletes can’t handle this much load. In such cases we then program just two patterns, plus a few midsection exercises during the strength sets. This “split program” is illustrated below. Finger Strength. Three hangboard positions, three sets each, 5-10 seconds. You’re right, it doesn’t feel hard, so how can it possibly be working? The same way investing $1 each day works. Other Stuff. This is where you can tailor your training a bit. We work things such as lock-offs, stability drills, and some power movements. You can also add your energy-system work in here if you need it and have the time. The big key with Other Stuff is to avoid looking for more to do – simply do it at the end of the session if you need to. High End Aerobic: Airdyne 5 minute test.